Jesse Tree Advent Calendars make the perfect Christmas gift and are a wonderful way to share the gospel. 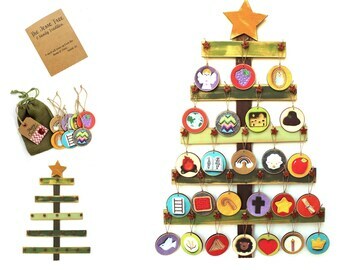 Families can have fun counting down the days until Christmas with with this Rustic Jesse Tree biblical advent ornament set. 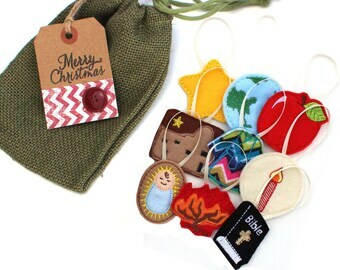 With this Rustic Jesse Tree Ornament Set you will receive 25 wooden ornaments, twine to attach for hangers, a book of daily scripture readings and a drawstring burlap bag (color of bag made vary slightly) with "Merry Christmas" tag for storage. 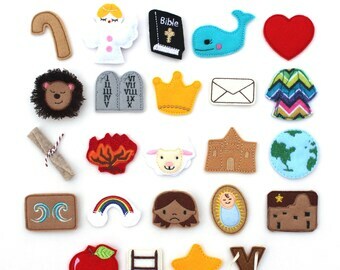 The ornaments are made using wood and vellum stickers. The colorful images are made from high resolution photos of our felt ornaments which are then printed on a vellum (high quality woven material) with a permanent adhesive backing. The stickers have a very colorful 3D look to them. The stickers were then attached to smooth sanded wooden circles with holes drilled for hanging. 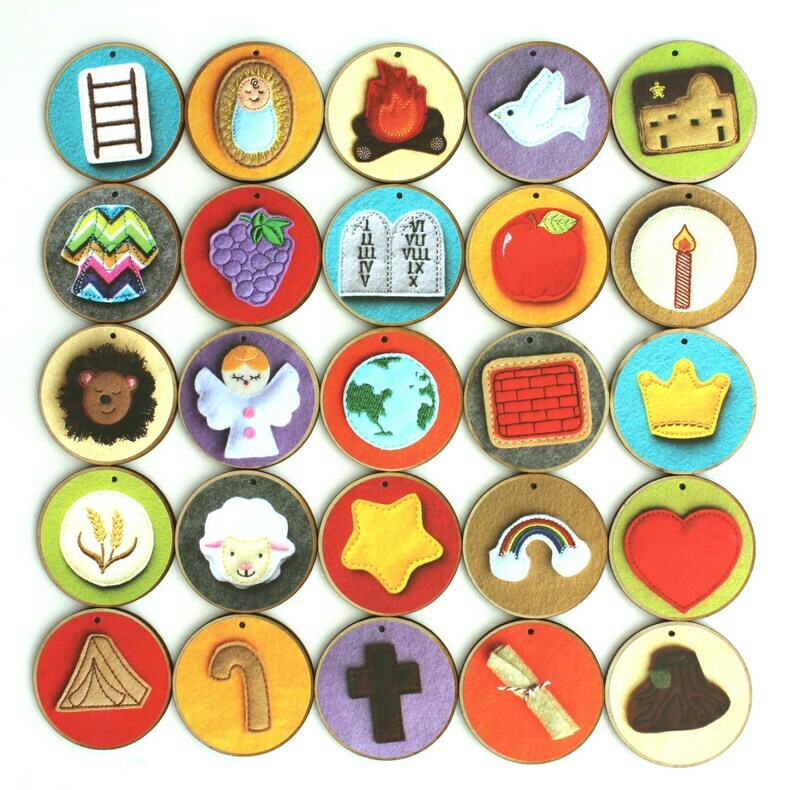 Each day, your family can read the provided scripture reference and hang the corresponding ornament on either your tree or you can purchase our wooden tree. This is a fun way to teach children and adults alike about the ministry and lineage of Jesus Christ. 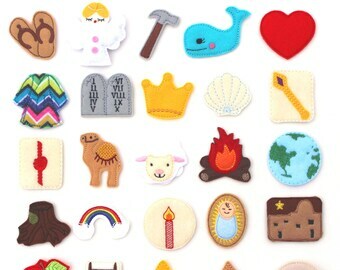 PLEASE NOTE: THIS SET DOES NOT INCLUDE THE SAME ORNAMENT FOUND IN OUR COMPLETED FELT SETS. THIS SET DOES NOT CORRESPOND WITH THE ANN VOSKAMP BOOK OR THE JESUS STORYBOOK BIBLE. 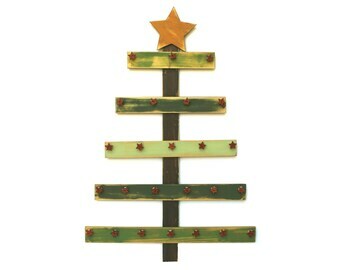 WOOD TREE SHOWN IS NOT INCLUDED BUT CAN BE PURCHASE SEPARATELY OR WITH THE SET. These make a wonderful gift for a very special holiday tradition. Copyright is owned by Baby WhatKnots LLC 2010-Current. 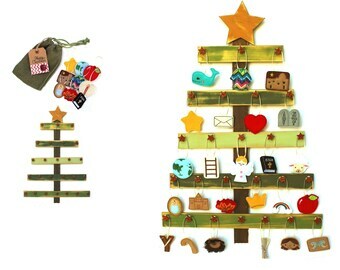 We have other Jesse Tree ornament sets and even a tree for hanging your ornaments available in our shop. Please click the links below to view our Jesse Tree offerings. 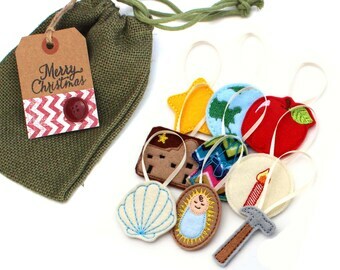 wood 2 3/8 x 1/4"
Jesse Tree Ornaments arrive packaged in a burlap drawstring bag with "Merry Christmas" tag. Perfect for gift giving. **Please remember each item is handmade so it is possible for some slight variation. The tradition of using the Jesse Tree each year is to be a reminder as to what the true meaning of Christmas is. 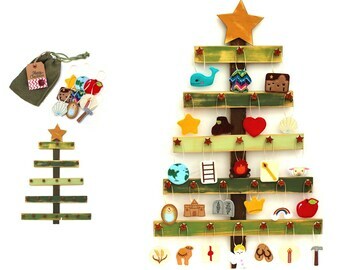 This Jesse Tree Set is to be used in the same way you would use the traditional Christmas Advent Calendar. There is an ornament for each day in December through Christmas Day. 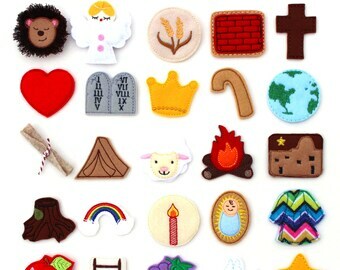 Each ornament represents a story from the Bible. These stories help to walk you through the Bible. Starting with the story of creation and ending in the birth of Christ, each ornament helps tell the story of God's plan to give us the gift of forgiveness and salvation through Jesus his son. I came across the idea to make a Jesse Tree for my family a few years ago while attending a MOPS (Mothers of Preschoolers) meeting at our church. I have found that it is the perfect way to teach children and adults alike the true meaning of Christmas. Each day in December leading up to Christmas Day, we will read a story from the Bible and my kids will place one of these ornaments on our Jesse Tree. This is a beautiful tradition to start with your family and I am happy to share it with you. On time and just in time! The ornaments are beautiful and well made. I take payment in the form of Paypal, Credit Card and Etsy Gift Cards. Payments must be made at the time of order. If you are unhappy with you purchase for any reason, please contact me to that I may assist you. Returns or exchanged for unused items will be considered within 14 days of purchase date. Buyer is responsible for return shipping. Original shipping paid will not be included in the refund. A 10% restocking fee will be applied to Jesse Tree ornament sets. Hello! Welcome to our shop. Our current processing time is 3-5 business days. Please let me know if we can answer any questions. We appreciate your business. First Class mail through USPS takes 3-5 days once the order has shipped. Priority shipping upgrade is available for US shipments only and takes 1-3 business days. Priority Upgrade can be purchased here, https://www.etsy.com/listing/154719892. Please note: the delivery time is an estimate given to us by the United States Post Office, sometimes packages are delayed and this is out of our control. If you have a specific "need by" date we highly recommend that you purchase the upgraded Priority Mail Shipping. We do not insure packages but insurance is available upon request for an additional charge. We are NOT responsible for packages that are lost, stolen or delayed if you have not contacted us to purchase shipping insurance prior to paying. We ship to the address listed on your payment account so please make sure your shipping address on your payment account is correct before place an order. Your order may be delayed if your account addresses different. We cannot be held responsible if your order has been shipped to the wrong address due to the payment account address being incorrect. Please note, our shipping charge is priced to cover the the following costs: the shipping envelope, the bag we package it in, the business card/coupon we include in each package, shipping labels, printer ink, the shipping charge from USPS, as well as my time spent packaging orders and any the cost for any gas used to get it to the post office. Q: What is the current processing time? A: Our current processing time is 3-5 business days. Q: Do we offer coupons? A: Yes, we do offer coupons throughout the year. The coupons are advertised on our Facebook page, www.facebook.com/pages/Baby-Whatknots/152695971407490. You can also "like" our Facebook page and then contact us there for a coupon code to receive 10% of your next order of $20 or more. * $20 does not include shipping and tax. Coupon is only good on regular priced items and cannot be used on items that are on sale. Coupon codes must be entered at the time of order. We can not go back and apply coupons to a previous orders. One coupon may be used per order, and they are not valid on wholesale or custom orders. Q: Do we accommodate custom orders? A: Yes, we do take custom orders. A custom order means we have to order special supplies to complete your request. When doing custom work we are usually unable to buy just enough supplies to complete one or two pieces and therefore are stuck eating the cost of the extras. Because of this custom orders may have a price increase. Please contact us to discuss further. Q: Do we offer wholesale pricing? A: Yes, wholesale pricing available upon request. Q: Do we offer a RUSH order option? A: Yes, we are usually able to accommodate a RUSH order request. RUSH orders do have a price increase of 25% on the total order value which includes merchandise total plus the shipping charge. RUSH orders purchased before 4:00 pm Central Time will be shipped the next business day with the exception of the Jesse Tree Sets, they will ship within 2 business days. Coupon codes used do not apply toward the RUSH portion of the price. Q: Do we except returns/exchanges? A: If you are unhappy with you purchase for any reason, please contact me to that I may assist you. Returns or exchanged for unused items will be considered within 14 days of purchase date. Buyer is responsible for return shipping. Original shipping paid will not be included in the refund. A 10% restocking fee will apply to Jesse Tree ornament sets.